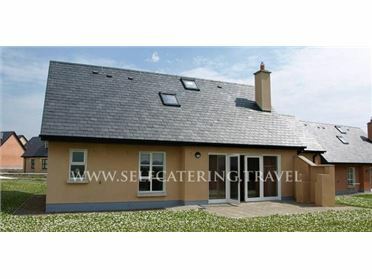 Stramore is a ground floor cottage set near the town of Grange in County Sligo, Ireland. It has two bedrooms, comprising of a family room with a double and a single, there is also a double room and a family bathroom, the cottage can sleep five people. Also inside there is a kitchen and a living dining room with an open fire. To the outside there is off road parking for three cars and a gravel area. Stramore is a charming cottage in a delightful location. The village of Grange in County Sligo is the starting point for a spectacular drive through the Gleniff Horseshoe with its limestone cliffs in the valley between the Truskmore and Kings Mountains. Grange is at the foot of the Dartry Mountain range with its distinctively shaped Benbulben Mountain which is known worldwide as the symbol of County Sligo. Oil fired central heating with open fire in dining/living area. Electric oven and hob, microwave, fridge/freezer, washing machine, TV with basic Sky channels, WI-FI. Fuel, power and starter pack for open fire included in rent. Bed linen and towels included in rent. Off road parking for 3 cars. Enclosed gravel area to front and side of cottage. Note: Travel Cot Available on Request One well behaved dog welcome. Sorry, no smoking. Pub 10 minute walk, shop 1 mile. Restaurant 3 miles .